Dennita Sewell has been Curator of Fashion Design at the Phoenix Art Museum since January 2000. 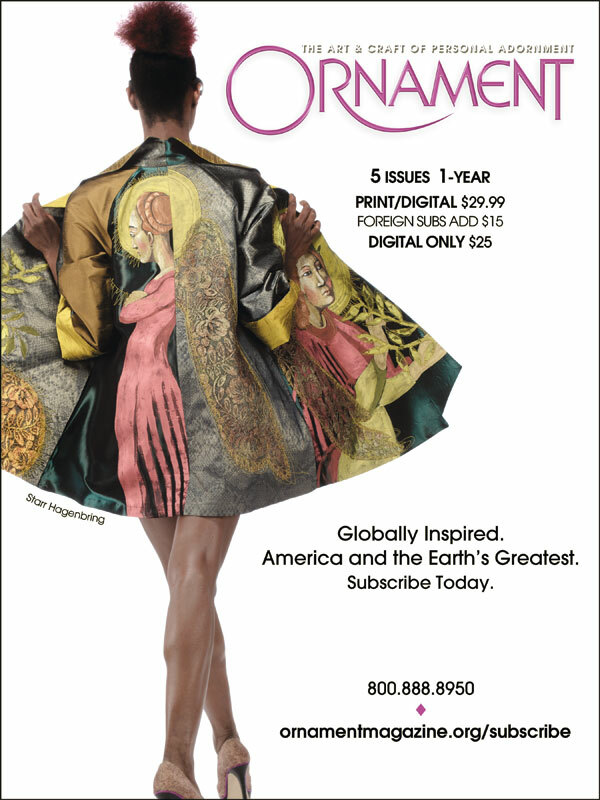 Her latest exhibition, “Fashioned in America,” was inspired by the 2014 documentary Make It in America: Empowering Global Fashion, directed by James Belzer (now available on iTunes). Sewell met Belzer when he screened his 2012 fashion documentary The Tents at the museum, and the exhibition developed in tandem with the film; Sewell even appears on camera. As a special director’s cut played in the background, I talked to Sewell in the museum’s Ellman Fashion Design Gallery, amidst ensembles by designers who produce at least seventy-five percent of their collections in the United States. They range from newcomers like Rosie Assoulin, Misha Nonoo and Daniel Silverstein to established names like Anna Sui, Nanette Lepore, Monique Lhuillier, and Oscar de la Renta. ETHNOGRAPHIC AND ANCIENT BRACELETS arranged on the frosted Plex of a FOBA sweep table, illuminated from above with a small Chimera softbox, set at 800 watt second power from a Norman P2000D power supply. The Canon 7D was set at ISO 100, lens at f32 and hand-held. The African, Asian and Native American bracelets of stone, shell, boar’s tusks, metal and glass are 6.3 to 10.7 centimeters diameters. Note that shadows are softer with the Chimera softbox compared to those on flash-mounted diffusers. Photoshop was used to resize the images to 320 dpi, sharpened and auto color corrected. Photographs by Robert K. Liu/Ornament. As a photographer, I constantly think of how I can improve my photography or how to better utilize my equipment. While waiting for my new book, The Photography of Personal Adornment (Liu 2014), to land in California, I realized that I had not used some of my older equipment for a long time, perhaps not since I switched from shooting primarily film to digital. Knowing that this year I have to travel to photograph out of the studio, I wanted to know what was the minimum of equipment I needed to carry, yet be capable of taking macro images that were of good reproduction quality. INSTALLATION VIEW OF “DEATH BECOMES HER: A CENTURY OF MOURNING ATTIRE,” at the Metropolitan Museum of Art, Anna Wintour Costume Center. The exhibition followed the period from the 1830s to 1915, when average life expectancy was less than fifty and death in childbirth or as a child was common. The ensembles ranged from states of full-mourning to that of half-mourning. Photographs by Carolyn L. E. Benesh/Ornament. Surprisingly, and surprisingly not surprising, the recent fall costume exhibition at the Metropolitan Museum of Art refashioned appreciation for mourning garments, a form of dress that no longer dominates world traditions. In “Death Becomes Her: A Century of Mourning Attire,” visitors noticeably crowded around the soberly dressed mannequins housed in the confining space of the basement gallery. The gallery has recently been renamed the Anna Wintour Costume Center. Wintour is the celebrity editor-in-chief of Vogue and the museum’s chair for its annual fundraising gala, since 1995. Attendees seemingly took as long to experience this unusual and smaller thematic display as the earlier expansive main floor blockbuster in the spring for couturier Charles James. Perhaps some necessary self-reflection and identification took place, as its subject is one that touches us all. This exhibition dealt not in bursts of color and iconoclastic design but rather the important subtleties of black and gray, the shadow colors that honor life’s end and our final rite of passage. Gray silk wool poplin, black silk faille, black and white silk cording and fringe make up an American wedding ensemble from 1868. Just as the Charles James exhibition illuminated a portion of cultural history through fashion during the twentieth century, so did this display of clothing from the Victorian and Edwardian periods. For most of history, death struck humans early and often. Rituals developed over the world, and every culture has its way of marking the life cycles from which we all partake. Birth, marriage and death rituals purposely concentrate our minds on the significance of transiting the arc of life and memorialize the universality of human experience. like it today. While one tradition has not been entirely dismantled—black is still the favored color of mourning—in other aspects of funerary occasions, dress has become so casual and colorful that T-shirts/shorts/and flip flops are considered to be just fine and not disrespectful to the departed. “Death Becomes Her” follows the period from the 1830s to 1915. Average life expectancy was less then fifty and death in childbirth or as a child was common. Infant mortality was so ubiquitous that some parents did not name their children until their first year was reached. Disease and the Civil War only added greatly to grieving periods. A woman could always be in mourning clothes for her child, husband, parents, grandparents, and more distant family members. A husband, though, could leave mourning and remarry in as short as a month and was much less likely to be censured for doing so. The emergence from deep black to glossy black to browns and grays is another indication of leaving mourning. Not only her comportment demonstrated familial grief but also what a woman wore in public. Various societal conventions dictated what was appropriate during the grieving process. First, one wore all black, and then over time some white detailing was allowed; as more time passed, gray gained entry to the mourning palette. The final distinction was still visually somber but could flash something a bit more luxe, such as the exhibit’s silk dress embroidered with mauve sequins worn by Queen Alexandra when in half-mourning for Queen Victoria. During deepest mourning, the cloth consisted of a light gauzed crinkled crepe with a matte finish. Later a bit more sparkle and sheen with silks, taffeta and moiré could be introduced. Bombazine was often used (a combination of wool and silk) as it kept black dyes the best. The dresses could be very beautiful and becoming with an elegance that also showed both dignified feminine grace as well as sexual appeal. Not yet among the dead and very much alive, women had to balance the difficult performance of combining decorous restraint with seductive allure to show themselves as available to males. Remarriage would secure their financial protection, a vital necessity for survival in the Victorian/Edwardian eras, as with most of human history. While mourning dress was a visual symbol of grief and respect for the deceased, it also gave clues to the woman’s status and taste. Wealthy women could commission apparel from the House of Worth while those less fortunate took an existing dress and dyed it black. The few menswear showed the degree to which males of the time mostly dressed in dark, uniformly subdued fabrics anyway, so their attire in mourning scarcely changed. QUEEN VICTORIA MOURNING DRESS In black: silk taffeta, silk ribbon, silk lace, silk crepe, 1894-1895. The two views of Victoria’s dress show the magisterial sweep of her gown, as well as the dispensing of forms of corseting that would bind and reshape her fulsome figure. Brooklyn Museum Costume Collection at the Metropolitan Museum of Art. The ensembles were fitted with gloves, hats, veils, and jewelry and illustrated how mourning progressed through its various prescribed phases. It was, of course, Queen Victoria who contributed so mightily to mourning practices. So over-the-top upset by her beloved husband Prince Albert’s death in 1861 the queen basically retired from all public life and wore black from that day forward to the end of her long reign and life. The exhibition showed one of her silk taffeta evening dresses, and unlike the other dresses which showed the fashionable tucked wasp waists, hers has none, an acknowledgment to her corsetless zaftig figure. Black mourning dress may have been the color of sadness but when you wear something for two full years, as expected of a woman grieving the death of her husband, the concept has to take into account just how long you can tolerate keeping the visual performance static, especially since the times are always changing. They inevitably spawned sartorial nuances and the basic fashions could still be imitated and not abandoned. Women’s journals, like Harper’s Bazaar, reassured as to what to wear from head to toe. Therein were found what hairstyles were acceptable, which cloth to buy, where to find mourning rings and lockets, pins made of jet, onyx necklaces, handkerchiefs edged in black lace, and lovely black parasols. Stores arose catering to the death demand and some developed solely for the purpose of selling mourning textiles, bonnets, shawls, veils, and gloves. The simplicity, starkness really, of the exhibition’s environment actually stimulated a lean-in experience. Closer examination revealed the variety and detail that black could bring to fabric, texture and patterning. It was a valuable lesson in how a severe limitation can be a guide leading to creative diversity. Exhilarating in its own way, it helped to sharpen and focus the senses, just as observing ritual, in this instance the expression of public and personal grief, was meant to achieve in practice. Communicating their sorrow without speaking of it, the silent mannequins eloquently demonstrated this profound emotion. Somehow cathartic, one leaves behind the somber basement gallery, its poignant symbols of mortality, and takes the stairway to the Met’s main floor, feeling happy to be alive and eager to meet a new day. MANEATER II BROOCH of dyed holly, silver, 7.6 centimeters, carved and dyed wood with metal wire inlay, cast and fabricated pinback, 2011. Photograph by Taylor Dabney. MUTATION II BROOCH of African blackwood, twenty-two karat gold, fourteen karat gold, silver, 6.4 centimeters, carved wood with metal wire inlay, fabricated pinback, 2008. ORIFICE RING 17 of dyed holly, topaz, silver, 5.1 centimeters, carved wood with inlaid tube set stones, 2009. All photographs by Daniel DiCaprio except where noted. The history of contemporary craft, dating from the mid-twentieth century, early on included the craft show. Part of a post-World War II renaissance of our cultural and artistic life, these shows served as a conduit for the rediscovery and reminder of the critical role artisans have played in the nation’s development and to its material and spiritual progress. The Smithsonian Craft Show has been an important participant in this history. Since 1983 and located in the nation’s capital, it has hosted one of the nation’s best shows, where each spring it celebrates the creative spirit of America. Held at the National Building Museum, some one hundred twenty artists gather to present their handmade crafts, demonstrating with each piece the strong and enduring currents of innovation and creation native to this country. In 2015 the Smithsonian Craft Show sponsors its thirty-third annual event and its commitment to selecting the very best in craft is once more reaffirmed and validated by the talented artists who showcase their works. Here are some of them. Mingling classical formality with contemporary design, Mina Norton’s coats and jackets beautifully enhance the female form. Her forte while refined is also very spirited, strengthening and deepening over her career. With a fine art training background initially in Iran, her native country, Norton’s prior instruction extended to the study of design in London, before she moved to the United States and settled in New York City where she makes her home. Her art is also her business and it is important to Norton that each customer receives something unique; so in large measure her garments are improvisational one-of-a-kind productions. Her palette stems from a temperate black or gray, but then suddenly, wonderful color shifts in ochre, moss, teal, and burgundy enliven the overall atmosphere. Claudia Grau hails from Los Angeles. In the late 1970s at twenty-one she started her own company Grau Design and since that time has maintained an independent profile in L.A.’s fashion scene. Her work attracts performers like Cher, Diane Keaton and Bette Midler. Early on, her deconstructed and collaged clothing caught public attention and today she stills uses primarily recycled materials in bright eye-catching simple forms suitable for different sizes. An energetic entrepreneur, Grau has had shops on trendy L.A. streets, from Melrose to Sunset Boulevard where her own eclectic clothing is currently featured along with other artisans specializing in the handmade. First known for the application of beads to painted surfaces for additional decoration, Betsy Youngquist went on to challenge herself even further with beaded sculptures. This format has moved her into a singular niche in which to explore the intricacies of beaded embellishment. No one on the art scene is quite like her. Youngquist’s works take on an in-your-face assertive presence no matter the height, width or girth of her imaginative creatures. Fanciful, enchantingly strange even, the surfaces are mosaically bejeweled with beads and found objects resulting in figures born of magical worlds, far beyond our comprehension. A resident of Illinois, she is one of many this year who are previous entrants in the Smithsonian Craft Show. Youngquist has also exhibited at the National Museum of Women in the Arts, VIDA Museum in Borgholm, Sweden, and the International Doll Show in Kiev, Ukraine. Working with his son Shawn in the studio and on the show circuit, Horace Thomas is an award-winning leather artisan from Belton, Texas. Together they make handsomely crafted bags, belts, backpacks, and briefcases. Thomas’s work is not only of high quality, but also shows a sophisticated design sense that takes leather construction to a more intriguing level, such as with his more unusual pyramidal shapes. An asymmetrical bag, looking like a building in a state of collapse, is a clever trompe l’oeil. Thomas, who has been working for over three decades, is joined at the craft show by other dedicated leather artists, Mary Ellen Sisulak, Molly Grant and Libby Lane. The beauty and detailing in their work is far preferable to branded names like Fendi and Gucci. From Missouri, Michael Bauermeister’s domestic adornments harken from the land, its color, rhythms and patterns, and he is endlessly inspired by its variety and possibilities. He says, “Wood has become my voice and my language. Over years spent making things both useful and useless out of wood, the physical work of sawing, carving, turning, and polishing has become my contemplation. The real effort is in figuring out what to make next.” To push himself into the creative realm of making his sculptural wooden vessels and wall panels, Bauermeister initially draws from the tools and processes learned from years spent as a furniture maker. His training as a sculptor brings forth his carving, shaping, painting, and finishing skills. Adding to the result is what he calls the “traditional and not so traditional lathe techniques” from wood-turning that he also uses to shape his vessels. While Lucrezia Bieler calls Tallahassee, Florida, home, she brings an essential universal quality to her paper art (Scherenschnitte) that transcends any state, region or country. Her exquisite paper artistry, characterized by the extraordinary precision it takes to execute the pieces, is breathtaking anytime anywhere it is seen. The process, she states is “like woodcutting or sculpting, in that you start with a blank resource and create the art by simply cutting parts of it away.” Bieler’s works are from a single sheet of paper utilizing a pair of small scissors and profoundly dramatic in their intrinsic delicacy. The black and white paper cuttings heighten the visual effect in a counterpoint of light versus dark. Holly Tornheim, like Michael Bauermeister, Janel Jacobson, Norm Sartorius, Mike Shuler, and Archie Smith, is another experienced entrant in the wood category. Tornheim has exhibited at the Philadelphia Museum of Art Craft Show, American Craft Council Baltimore and San Francisco shows as well as at the Fuller Craft Museum and Wharton Esherick Museum. Residing in Nevada City, California, Tornheim is self-taught and for many years worked as a finish carpenter and has built and carved custom wood doors. Exceedingly graceful and fluid, her wood sculptures evince particularly naturalistic and tactile auras that beckon the beholder to touch and explore their surfaces. Other categories in the Smithsonian Craft Show include ceramics, basketry and furniture. From a large pool of twenty-eight, Marvin Blackmore, Bennett Bean, Sandra Byers, Fong Choo, and Melissa Greene show exciting and original ceramics. Among the far smaller group of basketmakers, there is no overlooking the superb skills of Debora Muhl and Mary Jackson, who both utilize sweet grass to very different ends. Christine Adcock chooses from a multiplicity of materials—including cottonwood, eucalyptus bark, torrey pine needles, and jacaranda seed pods. Stephen Zeh stays within the state of Maine where he lives and concentrates on the formal beauty that the Maine brown ash casts over his medium. John Cameron, from Massachusetts, makes elegant cabinets and other fine furniture on commission in his one-person shop in East Gloucester. Cameron began his career in 1984 as a boat builder’s apprentice, a solid foundation leading to the quality and strength of his work today. He expresses deep regard for wood and work when he says, “Each piece of stock is carefully chosen and sometimes resawn, exposing its best face. Boards are often from the same tree, providing a unity of color and hue.” In addition, all of his handles, pulls and hinges are also made in the shop and are vital components to the totality of his furniture. With thirty-four artists representing jewelry, it is one of the more formidable of mediums from which to collect. There are many superlative artists like Namu Cho, Steven Ford and David Forlano, Valerie Hector, Reiko Ishiyama, John Iversen, Ken Loeber and Dona Look, Gustav Reyes, Myung Urso, and Roberta and David Williamson. Born in Saarlouis, Germany, jeweler Klaus Spies first learned about the art of goldsmithing in Mexico during his travels. His home is now in the mountains of North Carolina where he has a studio and showroom in Asheville’s downtown. Spies utilizes many of the traditional goldsmithing techniques—chasing, fabrication, wax carving, casting—but translates them into collections for a more modern audience. Spies favors complex surfaces with matte, brushed or hammered finishes and he prefers sterling silver and eighteen karat gold, adding stunning gemstones, like rutilated quartz, to bring sparkle to his jewelry. Excellence at the 2012 Smithsonian Craft Show. Glass artist Raj Kommineni, from Massachusetts, focuses on vessels, sculptures, marbles, and paperweights. In 2003, after graduating from the University of Massachusetts, he established Kommineni Art Glass for the sole production of his small objects. His work is published in The Encyclopedia of Modern Marbles, Spheres & Orbs by Mark Block and Glass Line. Other glass artists at this year’s show include Brian Becher, Matthew Fine, Carrie Gustafson, Michael Schunke and Josie Gluck, Fred Kaemmer, Amber Marshall, Joyce Roessler, and Boyd Sugiki. Decorative fiber is a difficult practice and until recently not well recognized, but New Mexico artist Mical Aloni creates astonishing embroidered wall pieces. Visually hypnotic, her work seemingly draws from dreamscapes that remain well hidden from our daily life experiences. She learned embroidery as a young girl living on an agricultural kibbutz in Israel, where girls were expected to sew and make traditional embroidery. Vicki Essig, Leah Evans, Meg Little, Wence Martinez, and Claudia Mills are also artists in this category. Part of the importance of shows like the Smithsonian is the degree to which artists still honor their historical antecedents. Even though the contemporary craft movement places a high value on self-expression and individuality, it also references the long ancient tradition of the handcrafted object. It is an artform that transmits itself directly and immediately, with an inherent simplicity and purity inherent to its grounding in functionality. To attend the Smithsonian Craft Show is to share in the vital connections made between the hand, the heart and the mind. The handmade art found here is beautiful not despite its usefulness but because of it. 38.1, Smithsonian Craft Show, Show, Craft, Jewelry, Clothing, Washington D.C.